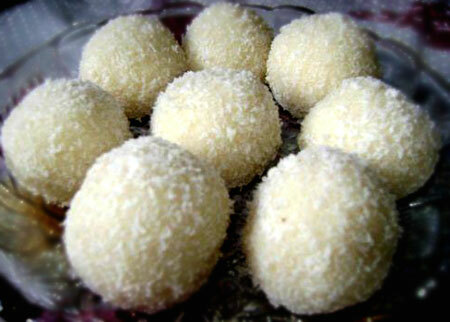 Coconut ladoo with condensed milk are the easiest dessert that can be made in a jiffy. Festivals or no festivals they taste so divine that one cannot help falling in love with it. These coconut ladoos are made with freshly grated coconut, semolina and condensed milk. Garnished with grated fresh coconut and flavored with nuts and cardamom powder these nariyal ke ladoo with milkmaid are the most popular Indian sweet recipe. These coconut ladoo are perfect for dinner parties, potlucks and picnics. Learn how to make nariyal ke ladoo with milkmaid. In a heavy bottom pan dry roast the semolina. Keep stirring it constantly and as soon as it starts to get slightly brown and a rich aroma is released take it out and keep aside. In the same pan dry roast the grated coconut also. When the coconut gets slightly roasted add the semolina, powdered cardamom and the milk. Mix well till all the milk is absorbed and the semolina gets cooked. Now add the condensed milk and nuts and cook till it becomes a thick pulp. Switch off the flame and keep it aside till the mixture has cooled down enough to be handled with bare hands. In a wide tray or plate sprinkle the grated coconut for ladoo. To make the ladoos grease your palms with some ghee or oil and now take a small lump of the mixture and roll it out in a smooth surface. There should not be any cracks. Once done roll the ball on the grated coconut so that the whole ball is covered with it. Place them in clean plate and let them stay untouched for few hours. Your yummy nariyal ladoos are ready to be eaten.